Visitation problems with children usually involves one parent interfering with the parenting rights of the other. Parenting plans are usually established in divorce judgments, settlements in divorce cases, settlements in Family Court, judicial rulings on custody and visitation issues. Usually one parent is the residential custodial parent, meaning the child lives with this parent and the other parent has visitation (parenting time) with the child or children. So what do you do if one parent does not comply with the terms of the court order or parenting agreement? In the short run it is important to document the interference with visitation rights. A written diary should be maintained documenting each and every instance of one parent interfering with the other parent’s access or parenting time with the children. Sometimes a mediator can be utilized to try to work out parenting time issues. If the parenting rights issue cannot be amicably resolved, it is strongly suggested you retain an attorney experienced in handling custody, visitation, and parenting rights issues. 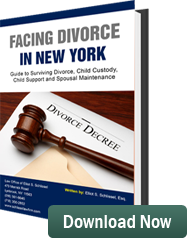 There are specific standards utilized by the courts in cases involving changing custody. Courts generally look for a change in circumstances before they will issue an order changing the residential custodial parent. Life is not stagnant. Parents may seek to relocate. Employment of one or both of the parents may change, and with this change there may be a different work schedule that does not work well with the prior visitation order or visitation agreement. If visitation (parenting time) arrangements need to be changed and the parties cannot amicably work this out between them, a petition must be submitted to the Family Court or if the parties had been divorced, an application can be brought to the Supreme Court to modify the terms of the divorce related to the visitation/parenting time schedules. Courts will utilize the standard of what is in the children’s best interest when dealing with custody and visitation issues. Protecting the children and allowing the children to reach their maximum potential and live a happy life is more important than the sometimes ping pong ball type of pulling back and forth between parents regarding visitation issues. If one of the parents does not live up to his or her responsibilities under Court Orders or visitation agreements this should be brought up to the judge handling the case and may be a ground for a change in custody. It is in the child’s best interest to have two dedicated loving parents. Courts are moving towards giving the parent the child doesn’t live with as much visitation as is practical. Children that have two parents who want to spend time with them are blessed. The children should be allowed to grow and prosper as individuals within the love and understanding of both parents.